The Dubai Duty Free Tennis Championships draw is in, and it's Federer's return to the Aviation Club after missing last year's event due to the torn meniscus. Not many of us expected he'd be taking to the court having just won the Australian Open which still feels somewhat surreal but he's heading into the tournament with plenty confidence. 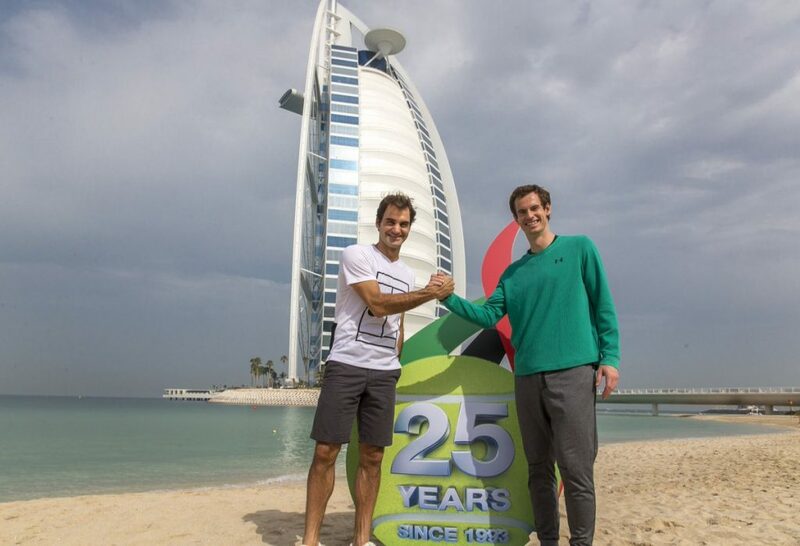 Combine that with Dubai being a happy hunting ground over the years (including defeating Djokovic in his last outing here in the 2015 final) I expect he will have a good tournament. First up is Benoit Paire whom Roger has defeated comfortably in their three previous encounters. Paire is flashy, has moments of brilliance like most French players but doesn't have the consistency week in and week out. He's capable of competing against anyone, but when Roger makes him play every point, I don't fancy his chances. Round 2 will either be Mikhail Youzhny or a Qualifier. Youzhny has no real form to speak of and has retired from 2 of his matches already this year so you can't see him causing too many problems. There are a few names in qualifying that are likely to beat him as well, so it's anyone guess who Fed may face in the 2nd Round. Into the Quarters and Pouille is the projected opponent. He's another guy out of form after a recent injury, but he's in the Semi Finals of Marseille later today against Gasquet. Pouille practised heavily with Fed in Dubai during the offseason, so they know each others game well. The Frenchman had some decent wins last year and should prove a tough test if they meet. Murray is in Federer's half, so the World Number 1 is the semi-final opponent. He's not played since his shock loss to Mischa Zverev in Australia, but he has a good draw. Jaziri can be a danger if he catches fire in the opener, but it's unlikely he sustains his big shotmaking over three sets. As for the final Wawrinka is the top seed in the other half and he's the defending champion. He's had knee problems since Australia, so again question marks surround his fitness. Quick courts aren't his favourite either so I'm not sure who comes through that side – Bautista-Agut, Monfils, Verdasco and Berdych are all likely finalists there. I'm expecting a few surprise results as on paper it looks wide open. Murray hasn't played any tennis, Stan has had a knee problem, Federer has just won a slam but has spent more time in the mountains than on the practice courts and still has a lingering groin issue, so I think it is anyone's to win. I reckon Fed will make the Semi Final's and hopefully faces off against Murray, should be a good encounter if this surface is playing how it normally does. What do you think of the draw? Let me know your thoughts in the comments. I am hoping for another title, but i guess it depends on his fitness… go for it Roger!!! Wimby No.8 over Novak, I can die peacefully. Looking at the above photo, somehow Sir Andy mostly manages to look like a bit of a slob. Roger, classy as always. The bottom half of the draw looks easier to me. After all these years, today I started to scan the draw and at first couldn’t find Fed’s name. I’m expecting to see his name as 1st or 2nd seed! Yes, hard to say who will be lifting the trophy at the end. If Fed gets past Murray, I’ll bet on him. On another note, seems Fed is doing pr stuff with everyone except Djokovic. Ever notice that? Novak has taken a wild card for Acapulco. Lots of top seeds there this year. Smart really, hard court close to IW. As the AO win was a nice surprise I have this dread that the ones we expect Fed to win he won’t but anyway if he is there and healthy it’s doable and if Youhzny gives a walkover then a rest could be good before Sir Muzz and Stan. Benoit will probably do a blinder now I’m getting ahead and assuming things. Sounds like Novak is serious again going to Acapulco where 5 other top ten are playing now Goffin has joined this group. 8 Dubai titles would be great Go Fed. Well he’s done Nadal’s academy and Laver Cup with Berdych. Doesn’t mean he’s not doing stuff with Novak really does it? Suppose he didn’t turn up at his restaurant in MC, but he would steal the show a bit tbh so no surprise. Murray’s clothes wear him, not the other way around. Heard he was simply a fan of RF. He can win this. Won’t be easy, though. Have tried to find out a bit more about the “leg issue” but can’t seem to find very much. Is it “just” the groin strain near the tail end of the Australian Open or has something else come up meanwhile? Wimby No.8, I was kidding. I’m just happy and grateful for Fed being who he is. Hi Murli, will you be there cheering for him? Hey Wanda, Of course. Tickets purchased for the semis. Of course will get to see the other semi too, hopefully Stan will be there ( have never seen him play live ) vs Monfils. Fed should make it to the semis. He has practiced with Lucas Pouile whom he may meet in the quarters. But one round at a time. Its home ground for Fed in Dubai so should get off the starting blocks pretty fast. Hoping to see SABR vs SABM and of course Stan too. Have a great time, Murli. Thanks Sue. Dubai is a fast court so the ‘Fleet-Footed-Fed’ is a treat to watch. And have you read the article which goes with it? Wasn’t as good a performance as the immediate reports made out – I think fed was understandably rusty, but it’s an excellent start to a tournament that, because it’s so quick, will be open to upsets. Hopefully a breezier round (I’d prefer Youzhny) will consolidate his form and we go from there. All i care for now is that Fed gets to the semis, because that’s when I will be there. Of course, if he reaches the semis and its Murray, then the chances are pretty good.